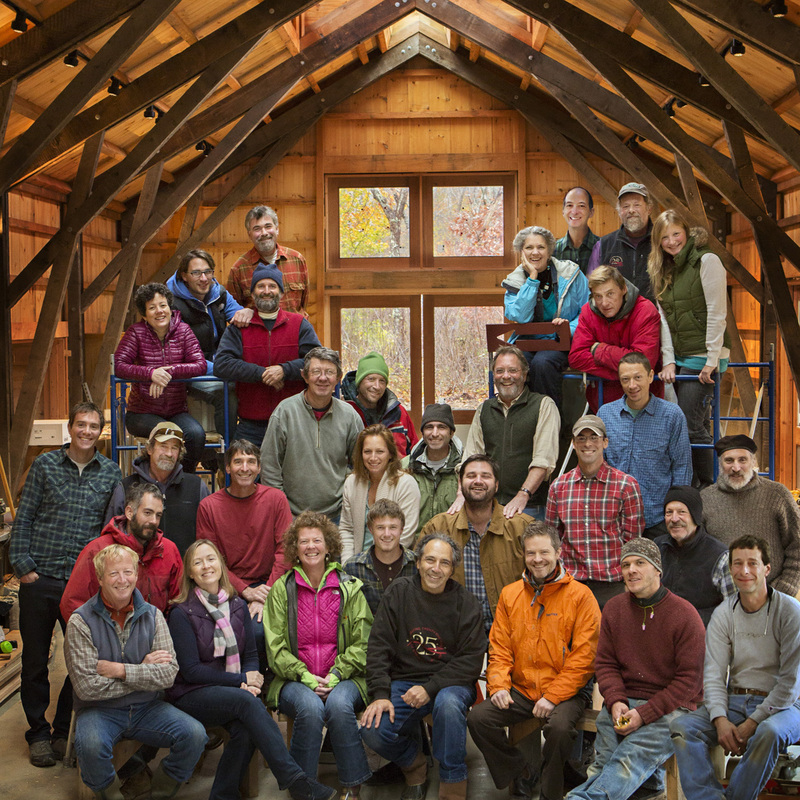 On the last day of 2012 our 25th year as a worker cooperative (and 37th in business) ended. It was an extraordinary year – rich, full, profitable, demanding, restorative, and uplifting. It was a year of many “first-evers”. On November 1st we welcomed three new owners at SMCo – the most ever at one time. When DonE Turnell, Marc Rosenbaum, and Aaron Beck became owners, it meant that 21 of our 30 full-time employees are now full owners. DonE worked here for 20 years before taking the buy-in plunge, our longest journey-to-ownership ever. And it goes back further – I can remember him as a 14 year old skate punk back in the early eighties. He hasn’t changed much. After his first SMCo Board meeting, he said, “It was kind of like a road association meeting but with less stupid people.” Less stupid people? Hey DonE, what are you trying to say?? Marc has been here for only 2 ½ years – when he was hired (after 30 years of running Energysmiths and 20 years as an SMCo consultant) the SMCo owners varied our policy of five years to ownership for the first time ever. And who knows? It could be the last. December 31st also marked the end of the United Nations International Year of the Cooperative. Worker cooperatives (and employee ownership in general) are emerging from the shadow margins of our economy. For the last decade or two I have noticed that the socially responsible business movement in the U.S. has been essentially deaf when it comes to issues of widespread ownership. 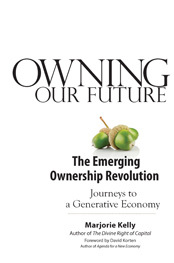 That is changing, and that’s important because, as Marjorie Kelly says in her seminal book Owning Our Future, published this year, “Ownership is the gravitational field that holds our economy in its orbit.” Which means trouble if ownership is concentrated and promise if it is well-distributed. For the next 30 years we lived on debt. During that time the top tax rate plummeted from a high of 91% to the current 35%. The 1 % thrived, the 99% did not. Meanwhile, the vast majority of working people have no voice. In a democracy the people who have to live with the consequences of a decision ought to participate in making it. There’s a legitimate start. In the U.S. today cooperatives employ more than 2 million people, generate over $500 billion in revenue and $25 billion in wages and benefits, according to the National Cooperative Business Association. Green Futures reports there are 1.4 million cooperatives globally, with 1 billion employee-members. I was recently talking to Melissa Hoover, the incredibly energetic and effective executive director of the U.S. Federation of Worker Cooperatives. She describes a 15 year arc of increasing interest in worker coops that resulted, seven years ago, with the founding of the U.S. Federation, which has become a vibrant national organization in a short time. Then, three years ago there were two major events: the founding of the Evergreen Cooperatives in Cleveland, which have been consistently in the news and held up as a model for urban economic revival, and the historic agreement of the U.S Steelworkers and the Mondragon Cooperatives in Spain. Melissa speaks with a voice informed by her central role in these developments. I can only speak anecdotally, but I can say for sure that this year we have had more inquiries and appeals for assistance from people interested in starting or transitioning to worker coops than ever before. My fellow baby boomers now own several million small businesses. During the next decade or two most of these founders will exit. The businesses will either be shut down, sold (usually outside the community) or they will be passed on. Many of these owners, who have poured heart and soul into these companies for 30 or 40 years, are looking for alternatives. Selling to the employees is an option that is becoming more widely understood. It offers powerful benefits to all parties and it is becoming an important entity of choice. Owning our work, and finding meaning there, is as essential to a good life as owning our homes. When the employees, who live in the community, and are part of the civic landscape, are making the decisions, it is more likely that the business will stay rooted in place, and there is more incentive to be a positive force in the community. We are a part of the place we are raising our children, and we have a long-term commitment to it. Community accountability is woven into the fabric of the cooperative system. While the global economy crawls toward a tentative recovery from the 2008 financial collapse, worker coops are proving to be surprisingly durable and robust. “Co-ops are built to be permanent businesses. They’re built for the long term,” explains Rodney North of Equal Exchange, an employee-owned Fair Trade brand selling foods from 40 co-ops in the developing world, with revenues of roughly $50 million a year. Twenty five years as a co-op for us. Here we go for number 26. Exactly one year ago today I said, “Our 25th year as an employee owned company looks like it will be a thrilling one.” It was. And I’m sure this one will be a wild ride as always. We’re getting younger and younger. Our oldest owner/employee (Mike Drezner) retired this year and we just hired Hunter Cottrell, our youngest full time employee ever at 20. The infamous Donald Rumsfeld once famously said “There are the knowns, the unknowns, and unknown unknowns.” What he didn’t say is that it’s our job to master the first two and always be prepared for the third. We’ll sure give it a try. And I hope 2013 will be a good one for you too.